->This is a rabbit hole career that doesn't have chance cards or daily tasks. Tested with Basegame + City Living (not required). Love money? Don't mind crime? It's time to join the Russian mafia. 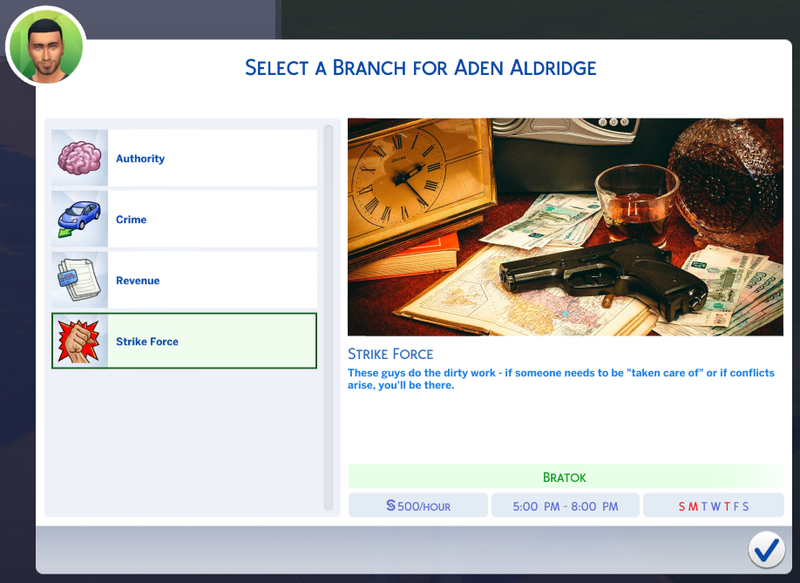 It offers a variety of fields - you can be part of the strike force, become authority, or even take care of the finances. Working for the bratva is never boring. ->Available in three languages: English, German, Chinese! 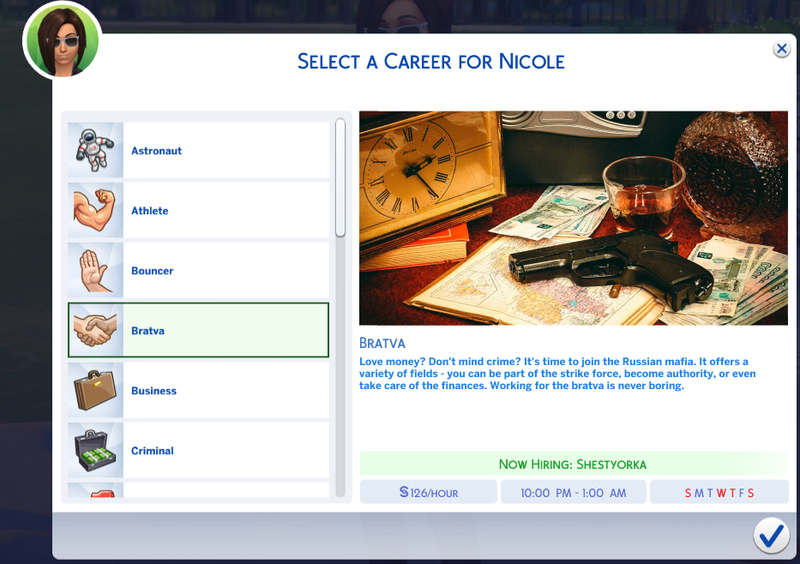 I made this career because some of my characters are part of the mafia in their story, and a quick (sloppy) search didn't turn up any existing mods. This is not based on any other career mod out there. It's not insanely complex, and the pay is probably obscenely high compared to the "standard", but there's other custom careers that are more balanced if that's your thing. While being a fully functional career, the intention behind making this was mostly RP purposes. Teens, YA, and adults can take this career, and you start out without vacation days - you'll only start earning them on higher levels. This is intentional. You don't just take a day off from crime! There is a common branch (Bratva) with two levels. Your Sim starts out as a low-tier member of the bratva and with some Charisma and Handiness can work their way up to the second level and afterwards choose one of the four branches. These branches also have two levels each. Bratva (Charisma & Handiness) - This is where you start. Strike Force (Charisma & Fitness) - These guys do the dirty work - if someone needs to be "taken care of" or if conflicts arise, you'll be there. Crime (Charisma & Handiness) - Beating people up isn't really your thing, and you're not boss material either. Numbers are kind of confusing as well. You'll just keep doing what you do! Authority (Charisma & Logic) - Others may be happy with stealing cars and mugging people in back alleys, but you've got more elaborate plans. You want to rise up in the ranks and be the one who tells the other members what to do. Revenue (Logic & Writing) - Numbers are your thing and you're reasonably smart but prefer to keep in the background - your new job is to take care of the finances of your Bratva. This is a part-time career! 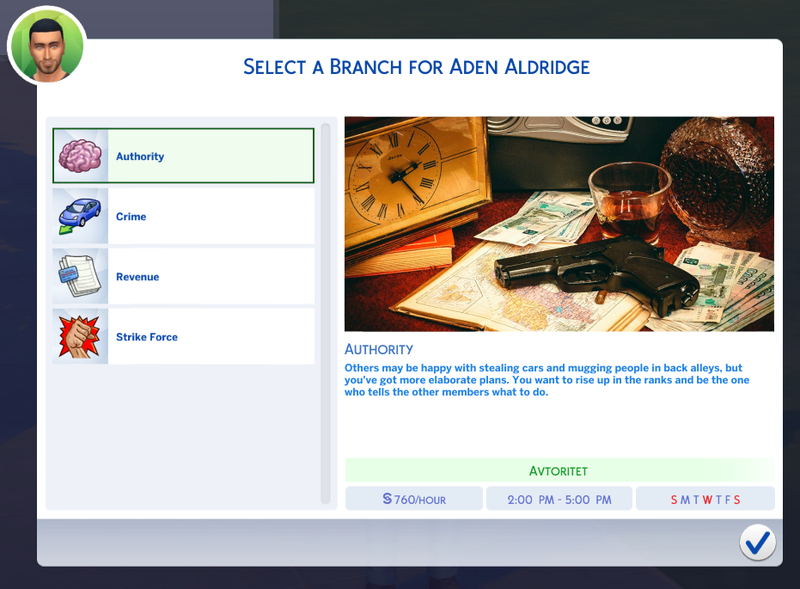 Your sims won't ever work more than 20 hours per week, no matter which level or branch. Lots of time for other activities. You're an associate, no one who's really all that indispensable. Your bosses give you tasks like scouting potential victims or assisting the Bratva in less important matters. Having earned the trust of your bosses, you are now being assigned more important tasks like carrying out criminal acts and recruiting new members. You are called when someone ruthless is required to do a job. Your daily life includes violence, and your bosses are rather happy with your work. The toughest cases are easy to handle for you, and you've got some neat scars to show off on top of it. You've reached the peak of your career, congrats! Even difficult jobs are not a big problem for you - whatever your boss needs to be acquired or sold, you can do it, with a few exceptions. You should make more connections to establish yourself. 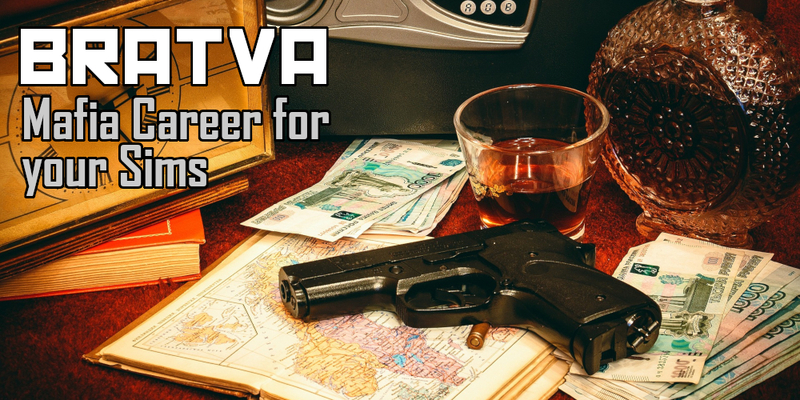 You get the biggest heists done and are an invaluable part of the Bratva. Your bosses know they can rely on you to steal things from under people's noses, sell whatever needs to be sold, and make new connections. With good connections and impressive work, you've been put in charge of your own group of bratok. Try increasing your influence further to advance even higher in the power structure. You've reached the top of the food chain - the whole Bratva obeys you, doing whatever you want them to do. You've got an army of loyal henchmen behind you, and sit on top of an empire of crime and money. Congratulations, you have it made! Your job isn't an average accountant's job. Most of the time, you have to go collect some debts on your own, but that's not a problem to you. Whenever you're not doing that, you do typical office things. You've earned a high-paying, high-power position - you're in charge of the other bookkeepers, and barely have to do much of the "manual" labor yourself anymore. Any regular accountant can only dream of your salary. Press Enter again. 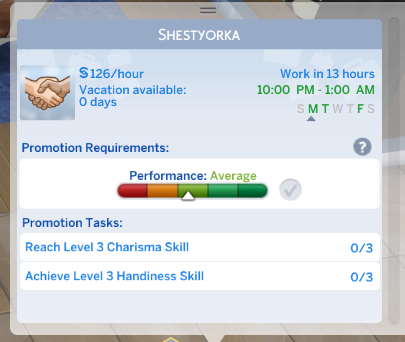 Your Sim should now have been promoted!